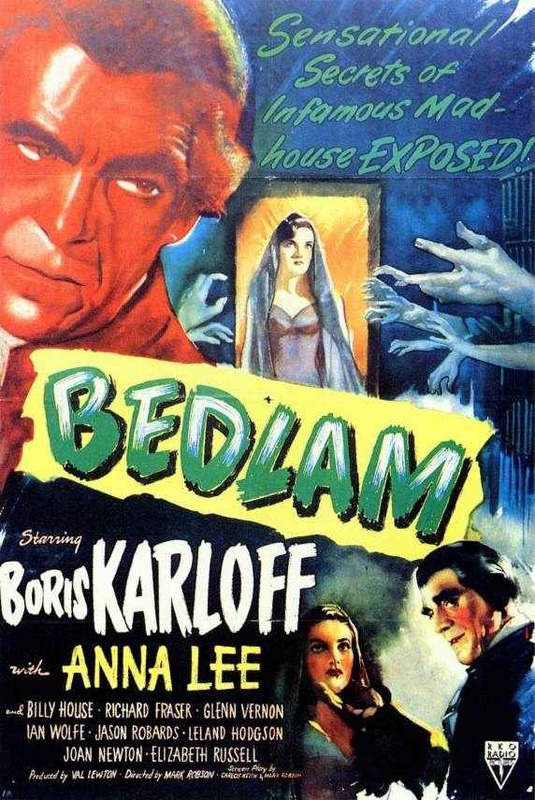 Mark Robson’s Bedlam, produced by the legendary Val Lewton, takes place in London in 1761. It was Lewton’s ninth and final horror film. A novelist, screenwriter, and producer, Lewton was a master of suggestion and eerie ambience. His films were the antithesis of Universal’s horror offerings, which offered iconic monsters and more overt shocks. Lewton had phenomenal success with his first horror picture for RKO, Cat People (1942, directed by Jacques Tourneur), and his reputation continued to grow with a string of classic and near-classic horror pictures; I Walked With a Zombie (1943, dir. Jacques Tourneur), The Leopard Man (1943, dir. Jacques Tourneur), The Seventh Victim (1943, dir. Mark Robson), The Ghost Ship (1943, dir. Mark Robson), The Curse of the Cat People (1944, dir. Gunther von Fritsch and Robert Wise), The Body Snatcher (1945, dir. Robert Wise), Isle of the Dead (1945, dir. Mark Robson), and Bedlam (1946, dir. Mark Robson). The screenplay for Bedlam, which was written by Robson and Lewton (under the name “Carlos Keith”), was inspired by the William Hogarth engraving of Bethlehem Hospital (a.k.a. Bedlam); the final plate in his 1735 series “The Rake’s Progress,” which depicts in detail the journey of its hero, William Rakewell, from an inheritor of his father’s wealth and happy cad to a broken man locked up in an insane asylum. Neither Rakewell nor anyone like him appears as a character in the film Bedlam. Rather, Lewton and Robson took the nightmarish images Hogarth created with such elaborate care in his depiction of Bedlam and shaped them into the window dressing of a film that, like The Ghost Ship and Isle of the Dead, is a meditation on the abuse of power. Hogarth’s vision was of a morally bankrupt society, from the monarchy and the church all the way down to the commoners on the street. Lewton and Robson took this idea and shaped it to their own ends. The inmates of Bedlam may be strange and threatening, but it is the men who control them who are the real monsters. This idea is exemplified in the first scene of the picture. A lunatic is attempting to escape St. Mary’s of Bethlehem Asylum by scaling the wall. He is forced to jump to his death when a guard carrying a lantern grinds his boot down on the man’s hand. The man who fell turns out to be an acquaintance of the grotesque Lord Mortimer (Billy House), who arrives at Bedlam that night for a spot of entertainment gawking at the loonies. “Everyone who goes to Bedlam expires from laughter,” he tells his companion, Nell Bowen (Anna Lee). When he discovers that his acquaintance has fallen to his death, however, Lord Mortimer is upset. He had paid the man for poetry to be delivered at a later date, and he feels he is now owed a night of entertainment. Enter George Sims (Boris Karloff), the apothecary general of Bedlam. Master Sims promises Lord Mortimer a play performed by his lunatics. Sims is a combination of the worst qualities of the characters Karloff played in his previous two collaborations with Lewton; the pure malevolence of cabman John Gray in The Body Snatcher and the twisted abuser of power General Nikolas Pherides in Isle of the Dead. Disturbed by what she sees at Bedlam, but not fully able to admit it, Lord Mortimer’s companion Nell returns to Bedlam alone and is taken on a tour by Sims. Leering, he tells her, “Ours is a human world, theirs is a bestial world, without reason, without soul. They’re animals. Some are dogs; these, I beat. Some are pigs; those, I let wallow in their own filth. Some are tigers; these, I cage. Some, like this one, are doves.” (Students of script machinations, however, will want to keep an eye on that “dove,” a woman in white who stands immobile, not speaking or blinking.) Also, it should go without saying that Sims’s ability to have anyone he wants committed to Bedlam, regardless of their sanity, will put Nell in grave danger when she breaks with Lord Mortimer and publicly ridicules him. The rhythm of speech and the language of the script is excellent, and evokes 18th century Britain in a way few of the hackneyed period pieces of the ’40s did. Even if it’s not a perfect replication of the time, it does a pretty good job, and all of the little details are a joy to pick out, such as the words “I love sweet Betty Careless” scrawled on the wall in Bedlam, a detail inspired by the man in the Hogarth plate who has scrawled the initials of his beloved, “Charming Betty Careless” — a famous prostitute of the day — on a banister. Viewers looking for a straight horror picture might be disappointed by Bedlam, although its scenes within the insane asylum walls deliver plenty of chills. Like many of Lewton’s later horror pictures, it’s an ambitious film that uses the trappings of horror to deliver a deeper message about a sick society. Posted in 1946, May 1946 and tagged Anna Lee, Bedlam, Billy House, Boris Karloff, Bruce Edwards, Carlos Keith, Elizabeth Russell, Ellen Corby, Foster H. Phinney, Frankie Dee, Glen Vernon, Hamilton Camp, Harry Harvey, Horror, Ian Wolfe, Jack J. Gross, Jason Robards Sr., Joan Newton, John Beck, John Carradine, John Goldsworthy, John Ince, Larry Wheat, Leyland Hodgson, Lyle Boyer, Mark Robson, Nicholas Musuraca, Richard Fraser, RKO Radio Pictures, Robert Clarke, Robert Seiter, Roy Webb, Skelton Knaggs, The Rake's Progress, Val Lewton, Vic Holbrook, William Hogarth. Bookmark the permalink.